Whether it's your property taxes, a summer vacation, or your Holiday spending, we all have expenses that seem to creep up on us through the year. Don't be surprised by these predictable expenses! Instead, set a savings goal to budget for them throughout the year. With the Free version of Goodbudget, you'll be able to track up to 10 More Envelopes for savings or goals. Get the paid Plus Version to track Unlimited savings or goal Envelopes. There are two types of Envelopes you can create: Annual Envelopes, and Goal Envelopes. Create an Annual Envelope for things that happen every year, like holiday gifts or property taxes. Give the Annual Envelope a budget amount and a due date, and we'll help you save that amount by that date each year. If you've already started saving, transfer that amount into the Envelope. We'll keep track of how much you've saved so far, and how much time you have left, to make sure you're ready by the due date! Use a Goal Envelope for things that only happen once, like a wedding or a new car. Give the Goal Envelope a budget amount and a due date. We'll make sure you reach your goal by the due date. Once you reach your goal, you're done! Start by clicking on the "Add/Edit" button in the Envelope tab to head to the Edit Envelopes page. There, scroll down to the "More Envelopes" section to create an Envelope to track your goal. Go to the overflow menu and select "Edit Envelopes". Tap on "+Add Envelope" in the top to create the Envelope. 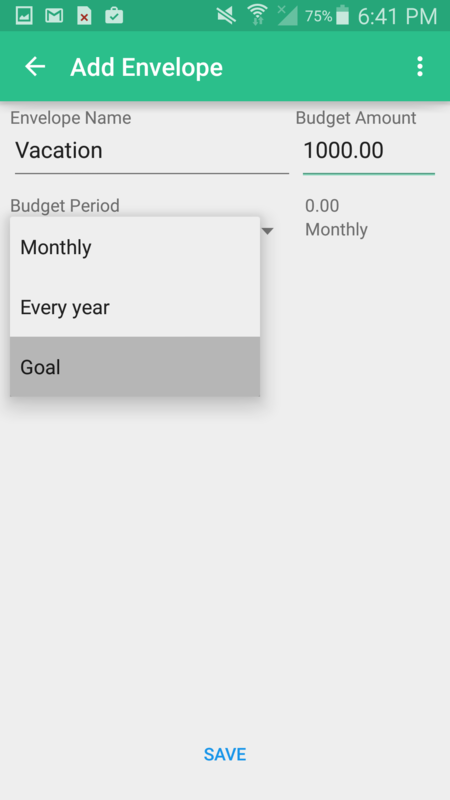 Use the Budget Period drop-down menu to select either "Every year" for Annual, or "Goal" to create a one-time savings goal. Over time, fund your Annual or Goal Envelope as part of your regular budget. Goodbudget will break down your savings goal into equal parts based off your budget period and due date. Fund the Envelope normally and by the time the due date arrives you'll reach your goal. When the time comes, you won't have to worry about how much you can afford. Use the funds you've been saving in your Envelope to pay for the expense.